French firm Dominique Perrault Architecture has completed a 220-metre skyscraper with a folded glass facade in Vienna, which has now become Austria's tallest building. DC Tower 1 was created by Dominique Perrault Architecture for a site on the eastern bank of the Danube, where it will be joined in 2016 by a smaller facing tower with a facade that will appear to mirror its undulating surface. 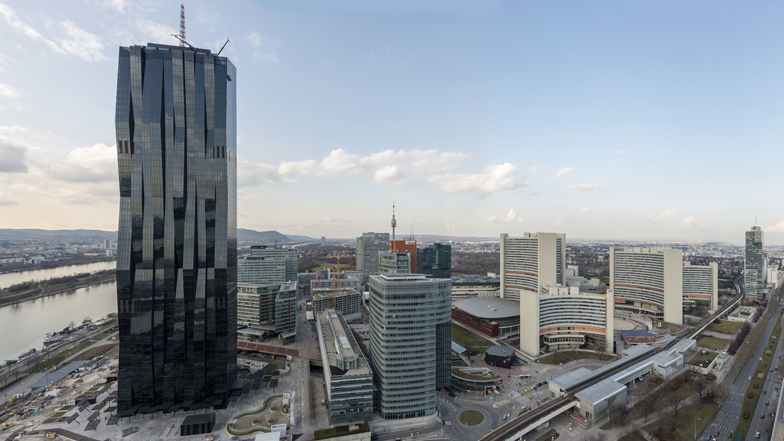 The 58-storey tower containing offices, apartments, a hotel and a top-floor sky bar rises above a public plaza in the Austrian capital's developing Donau City district. When the second tower is constructed it will be angled slightly so the space between the uneven facades of the two buildings will frame views of the city from the river. "The towers function as two pieces of a gigantic monolith that seems to have split into two unequal halves, which then open to create an arch with undulating and shimmering facades that bring the newly created public space to life in the void created there," said Dominique Perrault. In contrast with the slick, straight-sided walls on three sides of the tower, the faceted facade creates a shifting pattern of light and shadow that animates the surface and lends it a rippling quality. "The visual qualities of the folded facade create a new way to read the skyline of Donau City, its undulations signalling the entry point of this new polarity," said Perrault. "The folds contrast with the no-nonsense rigour of the other three facades, creating a tension that electrifies the public space at the tower's base." At the rear of the tower, a staircase leads from an access road to a long building that acts as a publicly accessible entrance and drop-off area. A series of square metal canopies arranged around the building's other elevations create a sheltered route across the plaza towards the entrance on the front facade. The interior was designed to have a raw, monumental quality, with structural elements including concrete columns and bracing beams left exposed. Materials including metal and stone are used throughout the lobbies and circulation areas to enhance the building's robust aesthetic. Walls and ceilings are covered in glossy black panels that echo the slick reflective surface of the facade, while simple fluorescent tube lighting adds a suitably industrial detail. Photography is by Michael Nagl, unless stated otherwise. From the start the project offered a site with incredible potential: an open terrain, facing Imperial Vienna, embedded in the geography of the Danube, lying on a plateau on the river's eastern bank, like a bridgehead to two Viennas. But the site was not virgin territory as several previous projects had been conceived for it. So there was a conceptual "already there", a thoroughly fascinating virtuality. Very early on, what kindled my interest most in this site was the bridgehead with the rest of the Donau City district, with the river banks but also the conditions for breathing life into a public space on an esplanade. We took advantage of this commission to design a genuine entry gate to Donau City. Reversing objectives for earlier development projects envisaged here, WED specifications called for a decidedly mixed-use program, an indispensable condition for germinating the contemporary urban vibration we were proposing to create in and around the towers. Today, the first of the two towers is up and the result is quite amazing, thanks notably to the invaluable collaboration of the Hoffmann-Janz architecture office. The visual qualities of the folded façade create a new way to read the skyline of Donau City, its undulations signalling the entry point of this new polarity. The folds contrast with the no-nonsense rigour of the other three façades, creating a tension that electrifies the public space at the tower’s base. The façade's folds give the tower a liquid, immaterial character, a malleability constantly adapting to the light, a reflection or an event. For interior spaces, on the other hand, with Gaëlle Lauriot-Prévost, the associate designer, we have tried to make the building very physical and present. The structure is not hidden, does not evade the eye. The exposed concrete framework is touchable. Stone and metal used in lobbies and circulations contribute to the tower’s generous and reassuring physicality. We have tried to avoid a tendency in contemporary architectural production to hide the architect's real work, of sewing, suturing the project and contextualising and anchoring it in the environment. Design emerges in a later phase. Towers floating above the ground are too severe, like architectural objects, objects in themselves. They must land, take root in the soil of cities, in places where their urban substance is found. The aim is to get the basic horizontality of the city and the public space to coincide with vertical trajectories. The work on the base and foundation of the DC Tower 1 was highly stimulating. Architectural arrangements determine the tower's relationship to the ground. On the back façade, the public space rises from the level of the esplanade in a series of staggered steps to reach the ground reference plane. This structuring of topography launches the tower and creates a spatial interface accessible to all, making the occurrence of such a physical object both possible and acceptable. On the other three façades, metallic umbrellas gradually rise from the ground on the approach, softening the violence of the eruption and blending city and movement into the tower's future. Important work on neighbourhood fringes remains to be done to reveal the geographic features of this urban landscape and take better advantage of the river bank.